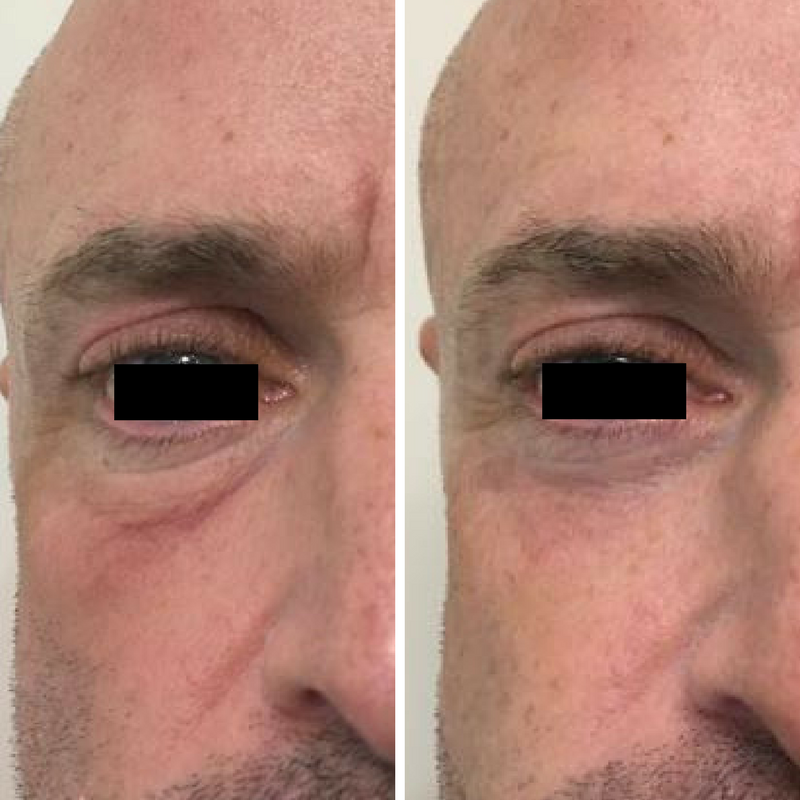 Heavy or baggy eyelids are a very common complaint and in fact, traditional surgical eyelid correction, is the 2nd most sought after cosmetic surgical procedure in the UK. 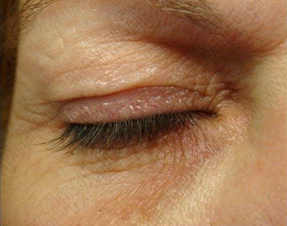 Redundant skin due to ageing, long-term inflammation eg dermatitis or smoking, results in descent of the upper eyelids. In early sagging, this still cause problems such as eye make-up smudging. 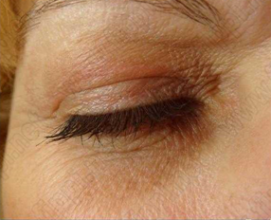 Below the eyes, the skin can be creased and give the eyes a tired look. Dr Patel is one of the pioneers of PLEXR in the UK. With this award-winning device, he can perform a “soft” surgical blepharoplasty. Therefore, without any needles or cutting of the skin, he can effectively remove excess skin from around the eyes. 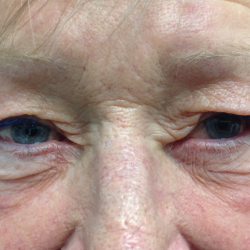 This has numerous advantages over surgical blepharoplasty including significantly less downtime and risk. PLEXR will also not negatively impact on the shape of the eye area or result in the scar line sometimes seen after surgery. Risks & Complications Very low risk; swelling, itching, hyperpigmentation. 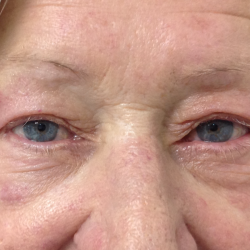 Non-surgical Eyelid Correction (Blepharoplasty)- 1-3 treatments usually required. The treated area will have a light brown scab present, which will fall off after 5-7 days. You will be advised to keep the scab covered with a patented medical foundation to protect the area from light. This will also give you some cosmetic camouflage as well. 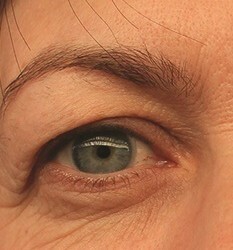 You can also expect a small degree of swelling, particularly in the case of eyelid correction. This will settle in a matter of days and is far less than anything you would expect after traditional surgery. Do not use an exfoliating cleanser over the area. You may use a PH balanced soap to remove the medical foundation. If all of the medical foundation does not come off, please do not rub at the area, just reapply over the top. Remember that this is a water-resistant foundation so it will not be removed with water alone. A full aftercare instruction sheet will be provided to you after the treatment. 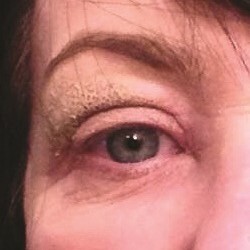 Most people are fit and able to drive following eyelid plexr but we would advise you to avoid driving to your appointment if you are having the procedure around the eyes. This is because some patients may have minor irritation and/or swelling and be unsafe to drive. What can I expect when I come for the treatment? On the day of your treatment, we recommend that you avoid make-up in the area to be treated if at all possible. After completing your consent form, your skin will be cleaned and then some numbing cream will be applied to the treatment area to help ensure your treatment is comfortable. You will be asked to let this take effect for approximately 30 minutes. You will then be taken to Dr Patel’s treatment room for the simple procedure. The PLEXR® device does not even touch your skin during the treatment. Depending on the size of the area to be treated, treatment time may take 10-30 minutes. Medical foundation will then be applied to the area with written aftercare instructions provided. You will have an out-of-hours number to call should you have any concerns, although this is extremely unlikely to happen. When activated, the instrument ionises the gas particles in the air between its tip and your skin. This creates an electrical arc which touches the very surface of the skin, causing the target tissue to ‘sublimate’ (go directly from solid to gas state), thereby preventing unwanted spread of heat downwards or across the skin. Tissue retraction is also a key benefit which explains its use in scar management and even non-surgical face/neck/body lifts. In a word, YES. Due to the revolutionary way in which PLEXR® works, it is an extremely safe device in the hands of a trained doctor. Dr Patel will discuss potential side effects with you during your consultation and you will be given plenty of time to pose any questions you may have.